Americans are horrible at saving money, but we love the thrill of playing the lottery. Last year, we spent more than $70 billion on lotto tickets (about $220 per person), while one in four Americans saved no emergency money at all. Lottery sales also tend to be driven by the most financially-vulnerable Americans. So some institutions introduced a new strategy: giving account holders prizes for saving money. While prize-linked savings accounts were previously legal only at credit unions in a handful of states, federal legislation passed at the end of 2014 will make the practice legal for big banks and credit unions in any state that does not prohibit it. "Folks aren't saving enough money," said Representative Derek Kilmer, who co-sponsored the bill. "Whether it's for a medical emergency or a lost job, having savings as a cushion is really important." The bill, which flew through both houses with rare bipartisan support, removed federal hurdles across several laws and will allow institutions to copy successful programs in Michigan, Nebraska, North Carolina and Washington. At least six other states have recently passed laws explicitly allowing similar programs. The first large-scale prize-linked savings program in the U.S. was created in Michigan six years ago. The program, called Save to Win, rewarded account holders for every $25 deposit in year-long certificates of deposit (CD) accounts with entry to a raffle. Winners could receive monthly prizes of up to $3,750 or an annual prize of $10,000. "Literally, you can't lose," said Kilmer. "The worst that happens is you save a bunch of money, and the best thing is you win a cash prize." Most of the participants in the program had never saved money before joining Save to Win, according to the non-profit Doorways to Dreams (D2D) Fund, which helped design the original Michigan program. Communicating Arts Credit Union in Detroit, Michigan, was among the first credit unions to be involved in the Save to Win pilot. Senior Vice President Kim Vermander said that the credit union's low income members have always struggled to save, but that many have committed to saving at least $12.50 from every pay check to participate in the program. "The lotto jackpot is pretty big right now, and a lot of people are just donating to the prize winner," she said. "Why not have people save? It's a no-brainer to me." Save to Win has distributed $1.58 million in prizes to more than 14,000 winners, but it has also encouraged account holders to keep hundreds of dollars in place for a rainy day. 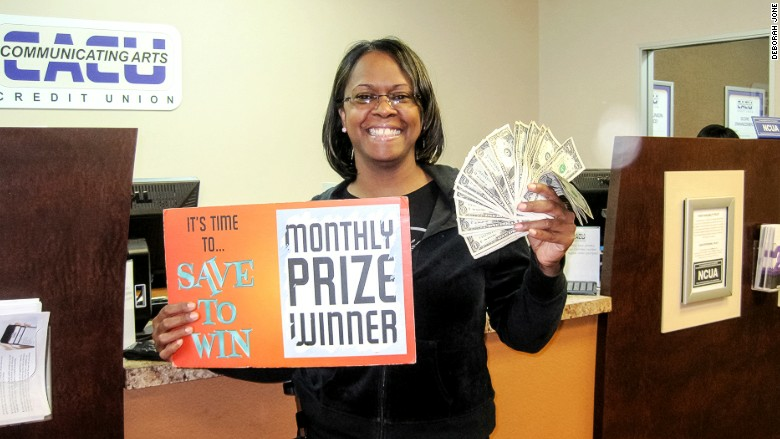 As of February 2015, Save to Win has helped more than 70,000 Americans save more than $40 million. "The key thing is there aren't good product choices," said D2D Fund Executive Director Timothy Flacke. "Most people look at savings like eating their vegetables, and this sprinkles some fun on something we know we have to do but put off." The new legislation will allow big banks to adopt similar accounts. Some banks have talked to D2D Fund about creating such products, but implementation will be cumbersome until more states alter their own laws blocking prize-linked accounts, said Flacke. Institutions of all types stand to gain from the accounts, which build consumer confidence and encourage account holders to try other financial products, he said. Prize-linked accounts improve savings rates, but they may not discourage people from playing the lottery. They don't seem to have had that effect in the UK, where similar products have been available for 50 years, said Flacke. "Maybe we can give you that entertainment value, but tie it to something that is actually good for you," he said.